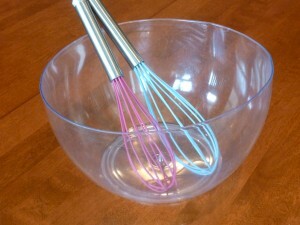 Stir Up Some Fun With Spring Colored Whisks! I found these colored whisks at Target and besides being perfect for using in a spring themed My Obstacle Course, I realized they would be perfect for building a skill I was working on with Andrew. I had introduced a stirring activity with him (stirring frosting with a spoon) and realized that it was too challenging for him because he didn’t have the hand muscle strength to dig in and move it around. I thought that these whisks would be perfect for him to build his hand muscles while grasping the handles and moving it through something that would provide just a little resistance…water! This is such a simple activity, and probably one that many of you have done with your children, however as Andrew grew up we never really had those pretending to “make soup” on the kitchen floor with pots and wooden spoons or “splash in the kitchen sink” water experiences. While he loves swimming, bathing and showering, he doesn’t like the possibility of getting wet and having wet clothes on. I have learned to reintroduce things that didn’t work before by making small tweaks, which also gives me a lot of insight as to what is standing in his way or what he is ready to handle at that time. some water and a few drops of food coloring when we got to the station! 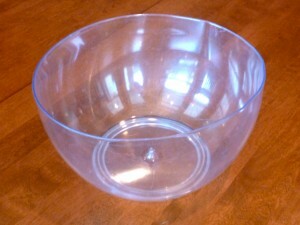 I also placed a rimmed cookie sheet under the bowl to catch any spills. The food coloring is not essential but I do find that it helps give this activity purpose, especially for someone who needs to see the purpose in doing something before fully engaging. 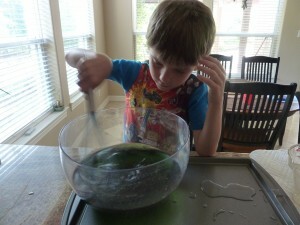 At first he hesitated, worrying that he wouldn’t be able to do it like he wanted but I could see he was curious about what would happen with the food coloring if he gave it a stir! I began by placing my hand over his so he could feel the pressure necessary to hold the whisk and also to show him how to move it around the bowl. 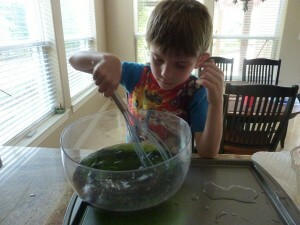 Stirring the water to make it green. Sometimes you have to look no farther than your kitchen cupboards to help your child build skills. 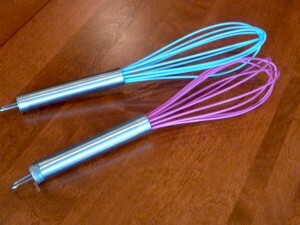 The colorful whisks just add a bit of fun and also keep his tools separate from mine 🙂 .